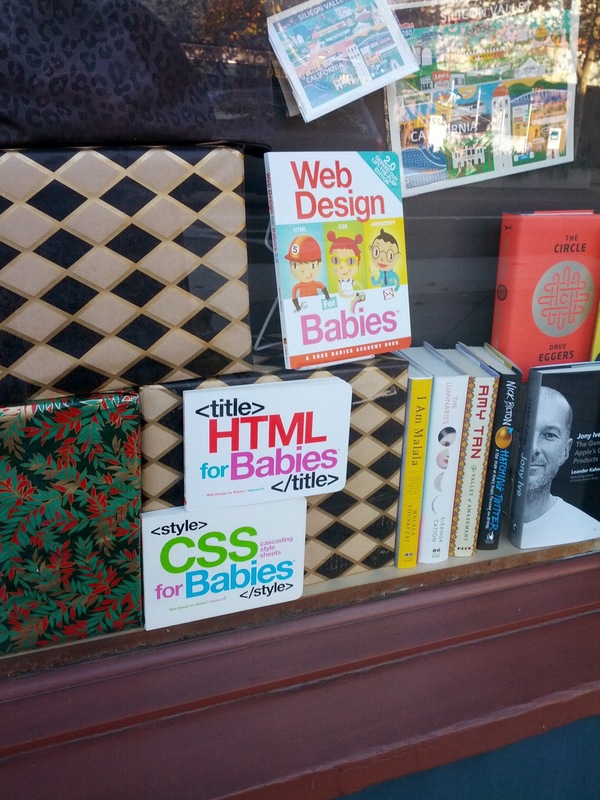 I saw these books displayed in the window of my friendly neighborhood Silicon Valley independent book shop, snickered and moved on. I came back later and snapped a photo because of the irony of code for babies on the most analog of analog media (ie book), and also because after thinking about it I heard the echoes of Susan B. Neuman’s Giving Our Children a Fighting Chance bouncing around in my head. The kids whose parents find this kind of book amusing, or who run in circles where this might be a tongue-in-cheek baby shower gift, are the kids who will have the tools for developing information capital at their fingertips. They will know how to code at a very young age, and they’ll have the digital literacy skills that will be necessary for them to perform the most basic functions in their lives. Digital literacy is socioeconomic power. And yes, it starts much younger than many of us might like (me included). I think back to Malcolm Gladwell’s Outliers and the various success stories recounted therein. Kids who have early and frequent exposure to ANYTHING are more likely to succeed at it; this is why we harp on and on about early literacy skills & early learning practices. Sometimes I even wonder if we push traditional literacy too young, let alone media literacy, but the more I think about new media in storytime in public libraries, the more I see the potential for leveling the playing field for kids who may NOT have access to the people, devices or know-how that they’ll need to develop these new and necessary literacies. Access alone is not enough. High quality content and highly-engaged adults are necessities, not luxuries. That is what children’s librarians have the opportunity to provide. Limit “screen time” for our youngest people, yes. By all means, warn parents and caregivers away from passive, linear and background media consumption. Keep in mind, however, that unless the zombie apocalypse hits, the future lives and livelihoods of today’s preschoolers will revolve around screens. And they will have to know how to manipulate them, or be manipulated by them. Chewing on boardbooks like these won’t turn every baby into the next Steve Jobs (or, more realistically, someone with varied and appealing job prospects), but continued, engaged exposure to the values and skills they represent might. That’s the fighting chance; having someone to explain why a book like this is funny. Now if you’ll excuse me, I’m going to troll Etsy for a 1st grader to build an app database for me. Posted on November 27, 2013, in Literacy. Bookmark the permalink. 2 Comments. Glad to have been a part of this thought process. That and dinosaurs. I’m not sure if this blog post would have happened if it weren’t for Professor Actual Factual.